This article is about the film. For the video game, go here. 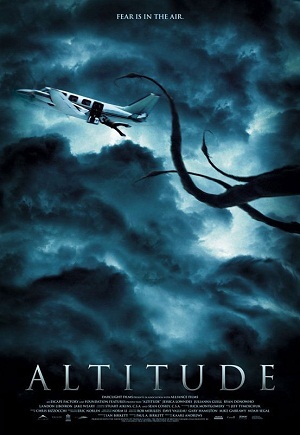 Altitude is a Canadian horror film directed by comic book writer and artist Kaare Andrews. It stars Jessica Lowndes, Julianna Guill, Ryan Donowho, and Landon Liboiron. Years after Saras mother died in a midair collision involving her light aircraft, Sara herself has recently earned her own pilots license, and plans to fly herself and some friends in a small plane to see a concert. While one of her friends, Bruce, is at the controls, a brief bout of turbulence causes him to lose control, taking the plane into a steep climb into the clouds. Now out of radio contact, disoriented by the clouds, and starting to run low on fuel, the four friends must figure out how to get down safely before the giant tentacle monster kills them all. Thats right, the tentacle monster. Dark World: In the clouds, and there are unpleasant things living in it. Deadly Road Trip: A variation, in that the "road" trip is by plane. Eldritch Location: After hours of flying around and descending with no ground or any other landmark features in sight and no radio contact with anyone, it becomes clear that the characters have entered some alternate dimension filled with endless sky and housing giant alien terrors flying around looking for prey. Eldritch Abomination: The giant tentacle monster that lives in the clouds is a terrifying creature from beyond and periodically shows up to eat one of the helpless main characters. Expy: Sara channels her inner Ellen Ripley when she takes control of her flight and asks her arguing passengers: "Is that acceptable to you? ", a line very similar to what Ripley asks her arguing crew in Alien after all hell has broken loose. Giant Flyer: The tentacle monster is building-sized. Hell Is That Noise: After the characters have been flying through the storm for a while, and it doesn't seem to end, and their altimeter says they should be in the stratosphere... all they can hear on the radio is this horrible screaming sound. Heroic Sacrifice: Corey dies after successfully unjamming the tail rudders and saving everyone. At the conclusion, Sara and Bruce sacrifice themselves to save their parents, thus allowing their past selves to have happier lives. Jerkass Has a Point: As Sal pointed out, where exactly was the ground? Reality Warping Is Not a Toy: It turns out that Bruce is inadvertently causing all this, unconsciously summoning the tentacle monster from his comic book into reality. With Sara's help he eventually learns to control his fear and summon them back to their own reality. Shown Their Work: The tentacle monster is based on a mythological creature called an atmospheric beast, currently lumped in the same cryptozoology category as Bigfoot and the Loch Ness Monster. Stable Time Loop: Subverted. In the opening a mysterious plane that appears out of nowhere crashes into Sara and Bruce's plane when they are kids and kills both their parents. In the present day it's revealed that the plane was in fact the one Sara and Bruce are currently piloting. In the conclusion of the film they enter a temporal vortex but manage to avert another crash while killing themselves, allowing their child selves to live with their parents alive. Twenty Minutes with Jerks: And what an illustrative selection of jerks they are!